As someone who has moved seven times in the past ten years, I consider myself a bit of a packing expert. When it comes to managing stress, finding your items and setting yourself up for success in your new home, packing efficiently and effectively truly makes all the difference. 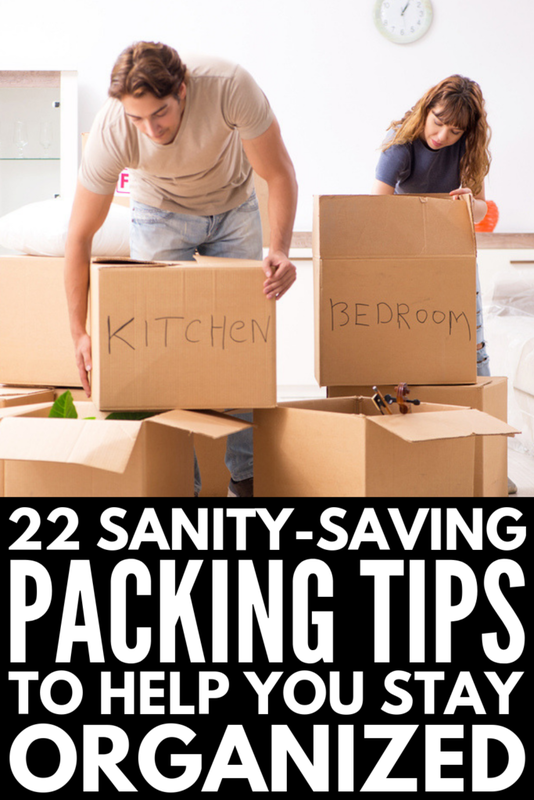 Here are 22 of my favorite packing tips for moving. Pack a suitcase with essentials for each member of your family. Pack a bag as if you were all going away for a week-long trip with clean clothes, toiletries, shoes and whatever other items you may need while you are getting settled at your new place. Pack an essential items box for your kitchen. Likewise, make sure to cobble together an essentials box for your kitchen with basic plates, utensils, napkins and maybe even your coffee maker—you’ll probably really need the caffeine! Bring a basic bathroom set-up. Make sure to put a few rolls of toilet paper and your favorite cleaning supplies somewhere handy too. A shower curtain and a few towels will definitely make your new place feel more like home! Pack by room according to your new home. Rather than go room by room in your current house and pack items up, plan ahead for how you will want to unpack in your new house. For example, if your current home has a combo guest room and office, but your new home will have two separate rooms for each function, you will want to pack office items in one set of boxes and guest room items in another. Clearly label and color code each box. It isn’t enough to simply scribble “bedroom” on the boxes and hope they end up in the right space. Instead, sketch a rough floor plan of your new home and color coordinate each room, then make sure each box is color coordinated in the same way. You can even grab a set of pre-color coded labels to make this task super easy. Label the sides of the boxes. Don’t label the top of each box as they will likely be stacked on top of each other. Instead, label 1-2 sides of the box so you can quickly see where the items belong. Keep your clothes on hangers. Rather than taking the time to remove every piece of clothing in your closet from their hanger just to put it right back up at your new home, keep them as is and use a plastic bag to keep your clothes protected. Alternatively, you can also buy inexpensive garment bags to transport items in. Simply grab the hangers and hang right back up at your new home. Take this opportunity to declutter. One of my favorite packing tips for moving is this: do not bring anything you don’t want to pack with you. Meaning, if you are really, really struggling to pack a set of vintage china, it’s possible you may not want these items anymore. Make sure to have multiple donation boxes in each room that you can add items to as well. Stock up on the right moving supplies. The right supplies make all the difference! Get the right-sized boxes and the good packing tape—you do not want your boxes bursting apart as you move! Use suitcases for heavier or breakable items. A suitcase will allow you to wheel items easily out of your home, straight into your new one. Just make sure you open them carefully! Take care of all the administrative items a week or so before your move. This includes setting up utilities, changing your address on your driver’s license and arranging any cleaning services you might like. Start packing well before you need to. Trust me, your move will be SO much easier if you do a little at a time every day. Start with items you don’t need access to like DVDs or books you won’t be using for a bit. Use linens like towels and sheets to wrap your breakable items in. This will help you pack faster and put your items to good use—just make sure you wash linens again before using! Try to get access to your new home early. Or delay moving out of your current home a few days longer if at all possible. A great packing tip for moving is to bring items over in waves, wherever possible, rather than taking one giant, stressful trip over. Hire movers. This is one of those packing tips for moving that seems obvious but it’s worth mentioning! If you can, hire movers to help. Not only will this make your move way easier, but it will also allow you to concentrate on getting your new home in order instead of hauling boxes. Unplug appliances at least 24 hours in advance. This is especially true of a refrigerator or freezer as they will need time to defrost before being moved. This means you’ll want to think backwards and not stock your fridge too heavily the week leading up to the move. Use clear plastic bins to pack items you will want sooner rather than later. This will help you quickly identify any items you are looking for at a glance, and the bins can serve as more permanent storage in your attic or garage later on. Cover the top of your toiletries with saran wrap. Take off the lids of your shampoos, lotions and other liquids, add saran wrap to the bottle top and then add the lid back on to help prevent potential leaks. Use Ziploc bags to keep screws together. As you are deconstructing pieces of furniture or dismantling items from the walls, keep all the screws together for each item in a clearly labeled Ziploc bag. You can then either keep all your bags together in one spot or tape individual bags onto the items they belong to. Take a picture of complicated setups so you can put it back together easier. This packing tip for moving works for wires on your tv, complicated furniture or any other item that may need a little extra memory power to put back together. Arrange for a charitable organization to pick up items the week before. You will likely have furniture pieces, boxes and miscellaneous items you would like to donate. Rather than packing everything up in the car and driving it to a donation center, arrange for a truck to come right to you to collect items. Just make sure you pay attention to what they will and won’t accept. Clean your new home before you move in. The last thing you want to do is to bring all your possessions into a home that is dusty and hasn’t been cleaned in a while. Take a few hours to scrub the place before moving in (or hire it out!) and it will feel so much homier! There you have it—22 of my favorite packing tips for moving! If you found this collection of packing tips for moving helpful, please share this post on Pinterest! And if you’re looking for more house-related tips and tricks, please follow our Household Tips board where we share all kinds of great ideas we find each day!